Hamilton will play host to the Canadian qualifying tournament for the Homeless World Cup, played in Amsterdam this September. Crouched in a corner on the floor of a bar in Mexico City, Ed Kiwanuka-Quinlan reflected on how far he had come. Five months before that night in 2012, Canada's flag-bearer of that year's Homeless World Cup was in a men's shelter following an attempted suicide and a bout of depression. One day some others at the Peel region emergency shelter asked him to join them for a game of kick-around. Five months later, he was celebrating the games in Mexico. "I looked at all these people who were dancing and were happy and celebrating all these things," said Kiwanuka-Quinlan, who no longer drinks. "And I could not find a reason to feel sorry for myself anymore." 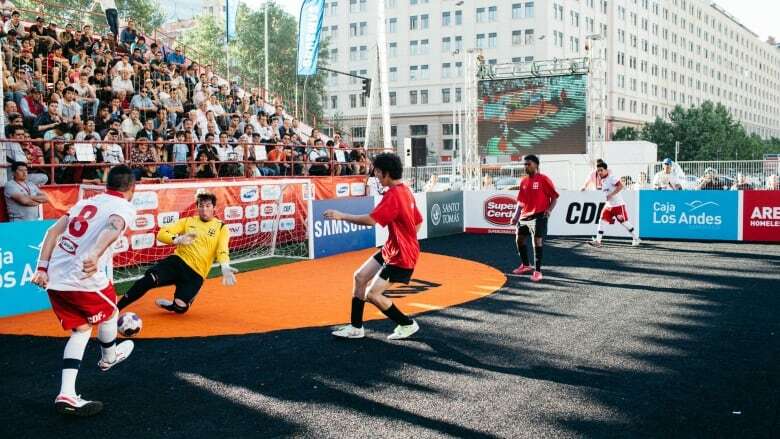 This year's Homeless World Cup will be held in Amsterdam this September. The Canadian qualifying tournament will be played in the shadow of the Pan Am Games in Hamilton, from July 12 to 20. It brings together nearly a dozen teams from across the country, including Comox, Kelowna, Calgary, Montreal, Ottawa, Toronto, Montreal, Hamilton and more, to compete for the eight spots on the Canadian roster. In 2012, Kiwanuka-Quinlan, who now lives in Brampton, Ont., was one of those eight. Since then, he got a job at Street Soccer Canada, the organization hosting the tournament. The team there also helped him find an apartment and get a job as a soccer referee. It was astounding to be part of a celebration with so many people," Kiwanuka-Quinlan said. "They treated us like professional soccer players," he said. I had never been a part of something that grand." On any given night in Canada there are 35,000 people sleeping on the streets, according to Homeless Hub's 2014 report on the State of Homelessness in Canada. More than 235,000 Canadians spend at least one night homeless a year, the majority of which are in emergency shelters. Poverty advocate Celeste Licorish said addressing the issues is paramount to the success of the participants, to ensure it's not just a blip of commitment for a free trip, but then "back to the shelter" afterwards. "Being defined by lacking is exclusion," said Licorish. "Being defined by an activity literally levels the playing field." Licorish runs the Speakers Bureau for the Hamilton Roundtable for Poverty Reduction, a forum to share stories to tackle negative stereotypes about poverty and homelessness. She supports the Homeless World Cup and the organizers' efforts. But Licorish points out a disparity: While there is an organization that can field a national homeless soccer team, there is no national homeless strategy. "Sports connect people," said Street Soccer Canada founder Paul Gregory. The organization has been sending teams to Homeless World Cups for 12 years, shortly after the tournament was started. By riding on the coattails of Pan Am, they're hoping to give participants a "festival atmosphere," Gregory said. "It's the soccer town." The sport is closer to indoor soccer with smaller nets, a short basketball-court sized field, and four people a side and one person limited to only being in the offensive side of half. "It makes for more interesting soccer," Gregory said of the format. He added his hope is that spectators "see the soccer first and the issues later." The teams and coaches will be housed at Mohawk College during the games, at a cost of $15,000. Gregory is hoping for donations and volunteers to help out with the event.